If you thought Nokia was going to stop at two Android phones, you were wrong: enter the Nokia XL, a 5-inch Android-based almost-phablet. Specs are a bit sparse at the moment, but we do know there's a 5MP camera with flash and auto-focus, and a 2MP front-facing camera. That 5-inch screen is a WVGA affair, too. Like all the Android-based Nokia X range, the XL comes without Google's Cloud services - instead, it focuses on Nokia and Microsoft's services like Skype (as you'd expect from a company in the process of being bought by the Windows-maker). The XL is powered by a 1GHz dual-core Qualcomm Snapdragon processor and there will be a dual SIM option. MicroSD fans will be pleased to hear of the inclusion of a microSD slot. 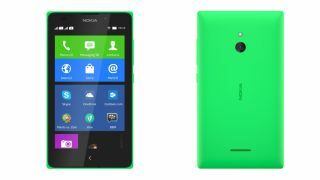 Coming in early Q2, the Nokia XL will be available in bright green, orange, blue, yellow, black and white, and it'll set you back €109 (around £90 / US$150 / AU$168).